Hosting family and friends can be a lot of work, but this Breakfast Bruschetta Bar for the Holidays will make your life much easier! A simple and delicious way to entertain your guests this season. The holiday season is wonderful but, boy, can it be stressful. Baking cookies, making hostess gifts, cooking multi-course meals for family and friends—some of whom are even staying at your home—it's A LOT. So how do you keep the season special and wonderful, while still being able to have time with your loved ones? With this easy Breakfast Bruschetta Bar! Picture it: Christmas morning and you've got a day of food prep and cooking ahead of you. You've also got a houseful of kids on break from school, plus visiting family and friends who are crashing at your place. The last thing you want to do is cook everyone breakfast, right? 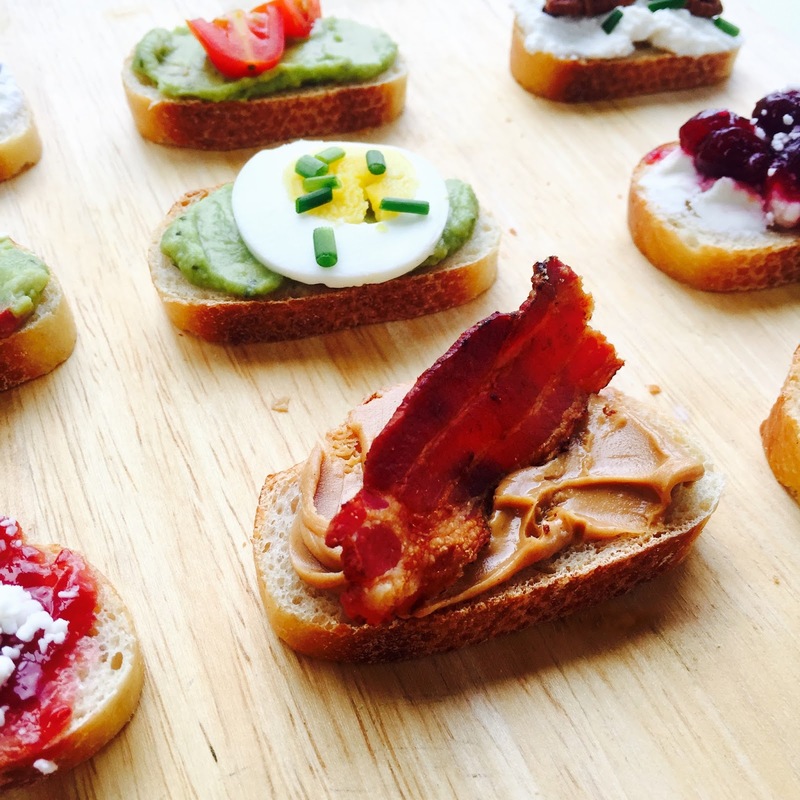 So just throw together this fun, colorful, and easy bruschetta bar and everyone can make their own breakfasts! 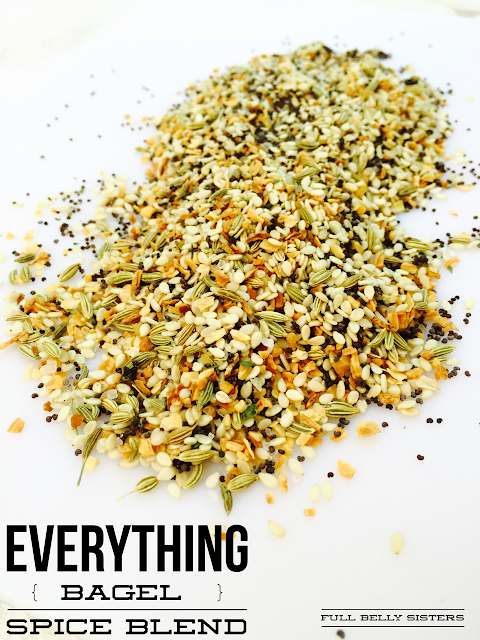 Assembling this beautiful bar of fabulous ingredients is easy with a trip to my local Stop and Shop! It's got freshly-baked breads, delicious cheeses and meats, gourmet jams, nuts and nut butters, as well as fresh organic and conventional produce. Talk about one-stop shopping! Of course, the holidays can also get expensive, so why not save some money while you're buying groceries? New online customers at Stop and Shop can get $5 off now! 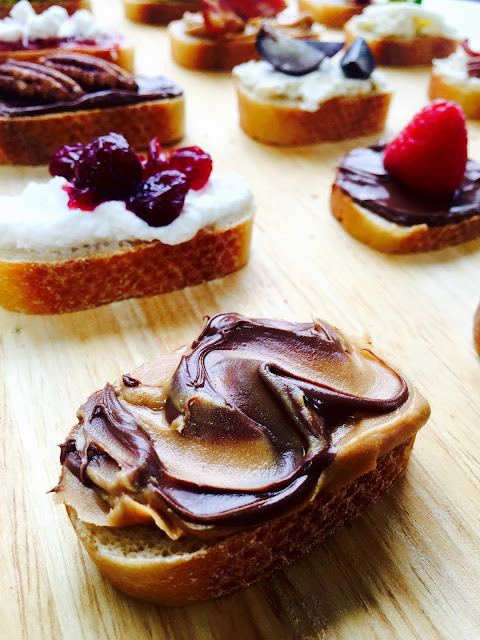 Assembling your Breakfast Bruschetta Bar for the holidays is incredibly easy. Put all your toppings in various bowls and plates—they don't all have to match! Remember, this is a fabulous meal but, more importantly, it's casual. Go for a combination of sweet and savory, crunchy and creamy choices. Toast a bunch of baguette slices and let everyone make their own delicious little toasts. 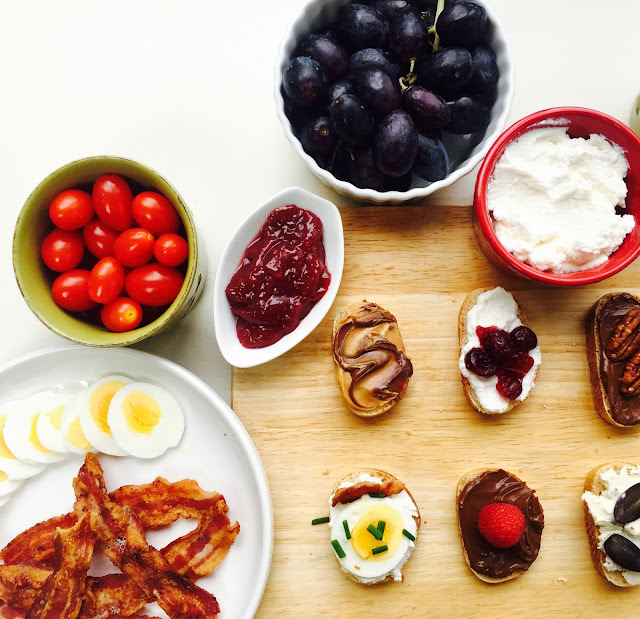 Here's what I put out on my breakfast bruschetta bar: black grapes, raspberries, jam, nutella, peanut butter, hard-boiled eggs, ricotta, crumbled goat cheese, grape tomatoes, guacamole (I bought Stop and Shop's yummy prepared version! ), garlic herb cheese spread, my homemade Crazy Easy Whole Cranberry Sauce, chopped fresh chives, candied pecans. Use your $5 off at Stop and Shop to buy a wonderful selection of ingredients that your friends and family would love, put them out on the table, and just let everyone mix and match. It's that simple! Such an easy and interactive way for loved ones to gather, talk, create delicious food together, and spend time with each other during the wonderful—but oh-so-busy—holiday season. Have fun with it and happy holidays! Don't forget to head on over to Stop and Shop now for all your holiday dishes—new online customers can get $5 off now! 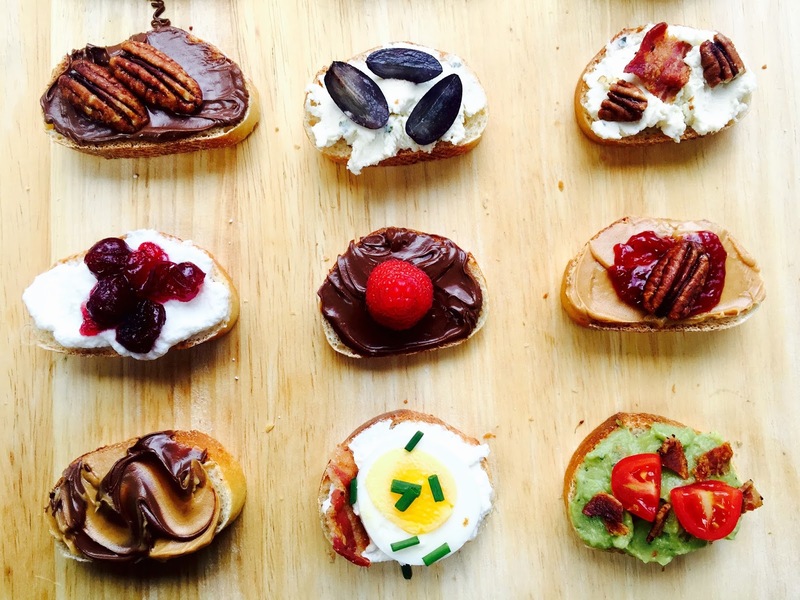 What toppings would you use on your breakfast bruschetta bar? This idea is really off the charts good! The bacon and egg is awesome! I'm drooling here - this is the best way to make breakfast. I LOVE IT! These are all such tasty and good looking ideas for little breakfast bites; what an original idea!!! Thanks for sharing, as always! Oh my goodness girl! You have put together some incredible flavor combos!! I want to try them all! With so many different dietary preferences this breakfast bar is brilliant for entertaining! From savory to sweet - I want a bite of each! Well, this is just the best idea ever!